I spent Saturday with a group of United Methodists from across my jurisdiction. The event brought together a diverse group of clergy and laity to discuss the pending effects of the Special Session of General Conference in February about human sexuality. By now, those who pay attention to the issues within the UMC on sexuality have not only opinions on the subject, but those opinions have hardened into positions. This was certainly true of this group. The larger body divided down into smaller groups of 8-10 at round tables for a moderated discussion in the “Circles of Grace” format. We considered 8 questions in a increasing level of depth. It was hard to imagine what the point of these discussions was supposed to be. My best guess was that because the UMC institution and leadership has sold its soul to the “One Church Plan,” with scant perception that it has little chance of passing, they were trying to foster conversations to help us realize that even though we had different opinions across the entire church, we could all sit in a circle together, talk about our feelings, sing Kum Ba Yah together and go home and continue to be united. Unfortunately, we all go home to a church just as dysfunctional and divided theologically, no matter how nice we were to each other. In fact, it was one of the questions we considered which brought into clear focus for me an issue on which we are painfully divided, which hasn’t received as much attention as others (e.g. Authority of Scripture, Lordship of Christ, etc. ): that of mission of the Church. This issue, along with the others, cuts right to the heart of our presenting problems with human sexuality. The question asked was, “What is your sense of the mission/purpose of the Church?” Aside from the obvious mission statement adopted by the General Conference, “Make disciples of Jesus Christ for the transformation of the world,” we were to each articulate our personal understandings of church and mission, i.e. ecclesiology. in the creation and sustaining of the church and its ministry, and in the eschatological hope for the world through the in-breaking of the kingdom of God. In this course, we discussed the various ideas and purposes for the church, with a special emphasis on the “Great Commission” as articulated in Scripture. Interestingly enough, only a few folks at the table used any of the language within the Scriptural mandates. Now, I make mandate plural because it could be argued that there are five versions of the “Great Commission” found in Scripture. There is one in each Gospel, and then one in Acts. Even so, those who did use Commission language used only the word “disciple,” which comes only out of the Matthean account. The other ideas had more to do with missions of mercy, compassion and hope, which one could argue was implicit in the Johaninne “feed my sheep/love” language, but in our own day and age, this tends to express itself in social justice apart from any proclamation activity. It was here where their conceptions of mission were most lacking. No one articulated a proclamation part of mission. 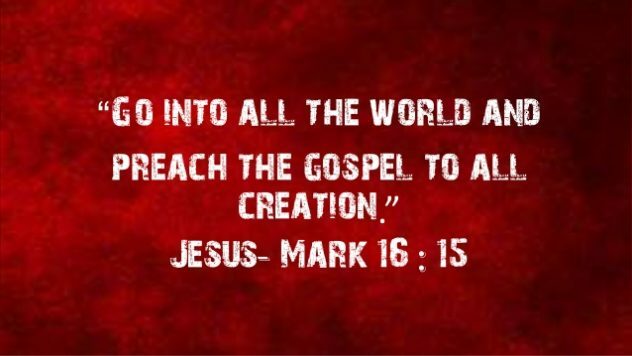 No one said anything like Mark’s, “Go into all the world, and preach the gospel to every creature.” There is a gospel to proclaim, but our people don’t even connsider that as a part of the mission of the church. Evangelion, evangel, the idea that there is “good news” in Jesus Christ, which the world needs to hear, is so part and parcel to the mission of the church and the accounts of Scripture, that to not have it articulated by any of the folks in my group, all of whom would have a “progressive” understanding of the faith, reminded me about how divided we really are theologically. Church in the “progressive” stream seems to completely ignore the gospel that “in Christ, God was reconciling the world to himself, not counting their trespasses against them, and entrusting to us the message of reconciliation,” and that “The saying is trustworthy and deserving of full acceptance, that Christ Jesus came into the world to save sinners.” This is GOOD NEWS! The world is broken, but in the atonement of Christ, the world is being redeemed from death and sin. God is saving a sin-sick world. It is the mission of the church to proclaim this good news to the wider world. Is there discipleship to follow? Certainly. Are there missions of mercy, compassion, justice and healing to be done? Most definitely. However, these are to be part and parcel with the hope of forgiveness for sin found only in Jesus Christ. I am reminded of the good E. Stanley Jones quote, “An individual gospel without a social gospel is a soul without a body and a social gospel without an individual gospel is a body without a soul. One is a ghost, the other a corpse.” Jesus came into the world to bring more than good teaching and show us how to love. He came to bring us back to God despite the depth and filth of our sinful condition. What does this say about where we are in the United Methodist Church today? It tells me that there is a substantial portion of our body that has an inadequate vision of the mission of the church, the nature of the fallen world around, and the power contained in the Gospel of Christ. Are there some folks who go to the other extreme? Are there people who emphasize too highly Jones’ individual gospel over a social one? Certainly, but I wonder if its easier for a classic evangelical (like myself), who tries to hold all of it in tension, to work with the one who knows to preach salvation in Christ, or the progressive who eschews gospel proclamation altogether. Is there such a thing as a Scared, Anti-Intellectual Christian? John–I am not of your faith tribe (although my father’s father’s family faith legacy stems from the Methodist Church), but I wholeheartedly share your concern as it relates to my faith community also. Thank you for a kind clarity of the mission of the church. Truly our Lord’s salvation is wholistic, but in the final analysis, if there is no “gospelizing of the story of redemption,” then we are simply a glorified social club. More posts like this are needed and helpful. Steve, I’m glad you found the piece helpful. Proclamation of the gospel is inherent in the word “gospel!” Thanks for reading!